The key to IBM's new data storage breakthrough is a threeatom-thick layer of the element ruthenium, a precious metal similar to platinum, sandwiched between two magnetic layers. That only a few atoms could have such a dramatic impact caused some IBM scientists to refer to the ruthenium layer informally as "pixie dust". Known technically as"antiferromagnetically-coupled (AFC) media," the new multilayer coating is expected to permit hard disk drives to store 100 billion bits (gigabits) of data per square inch of disk area by 2003. Current hard drives can store 20 gigabits of data per square inch. IBM began shipping Travelstar hard drives in May 2001 that are capable of storing 25.7 gigabits per square inch. Drives shipped later in the year are expected to be capable of 33% greater density. In each of the past five years, hard drive capacities have doubled, keeping storage costs low and allowing technophiles and PC users to sock away more data. However, storage buffs believed the rate of growth could continue for only so long, and many asserted that the storage industry was about to hit the physical limit for higher capacities. But according to IBM, a new innovation will push back that limit. The company is first to massproduce computer hard disk drives using a revolutionary new type of magnetic coating that is eventually expected to quadruple the data density of current hard disk drive products -- a level previously thought to be impossible, but crucial to continue feeding the information-hungry Internet economy. For consumers, increased data density will help hasten the transition in home entertainment from passive analog technologies to interactive digital formats. The key to IBM's new data storage breakthrough is a threeatom- thick layer of the element ruthenium, a precious metal similar to platinum, sandwiched between two magnetic layers. That only a few atoms could have such a dramatic impact caused some IBM scientists to refer to the ruthenium layer informally as "pixie dust". Known technically as "antiferromagnetically-coupled (AFC) media," the new multilayer coating is expected to permit hard disk drives to store 100 billion bits (gigabits) of data per square inch of disk area by 2003. Current hard drives can store 20 gigabits of data per square inch. IBM began shipping Travelstar hard drives in May 2001 that are capable of storing 25.7 gigabits per square inch. Drives shipped later in the year are expected to be capable of 33% greater density. In information technology, the term "pixie dust" is often used to refer to a technology that seemingly does the impossible. In the past decade, the data density for magnetic hard disk drives has increased at a phenomenal pace: doubling every 18 months and, since 1997, doubling every year, which is much faster than the vaunted Moore's Law for integrated circuits. It was assumed in the storage industry that the upper limit would soon be reached. The superparamagnetic effect has long been predicted to appear when densities reached 20 to 40 gigabits per square inch - close to the data density of current products. IBM discovered a means of adding AFC to their standard production methods so that the increased capacity costs little or nothing. The company, which plans to implement the process across their entire line of products, chose not to publicize the technology in advance. Many companies have focused research on the use of AFC in hard drives; a number of vendors, such as Seagate Technology and Fujitsu, are expected to follow IBM's lead. AFC will be used across all IBM hard drive product lines. Prices of hard drives are unlikely to increase dramatically because AFC increases the density and storage capacity without the addition of expensive disks, where data is stored, or of heads, which read data off the disks. AFC will also allow smaller drives to store more data and use less power, which could lead to smaller and quieter devices. Developed by IBM Research, this new magnetic media uses multilayer interactions and is expected to permit longitudinal recording to achieve a future data density of 100 gigabits/inch2 without suffering from the projected data loss due to thermal instabilities. This new media will thus delay for several years the impact of superparamagnetism in limiting future areal density increases. It also requires few changes to other aspects of the hard-disk-drive design, and will surely push back in time the industry's consideration of more complex techniques proposed for very high-density magnetic recording, such as, perpendicular recording, patterned media or thermally-assisted writing. The N-S poles at the gap end of the writing head further concentrate the field to make this region the business end, which is the area where the writing field leaks into space outside the head. When a magnetic storage medium (a spinning computer disk, for example) is put in close proximity with the writing head, the hard magnetic material on the disk surface is permanently magnetized (written) with a polarity that matches the writing field. If the polarity of the electric current is reversed, the magnetic polarity at the gap also reverses. Computers store data on a rotating disk in the form of binary digits, or bits transmitted to the disk drive in a corresponding time sequence of binary one and zero digits, or bits. These bits are converted into an electric current waveform that is delivered by wires to the writing head coil. This process is sketched in Figure2. In its simplest form, a one bit corresponds to a change in current polarity, while a zero bit corresponds to no change in polarity of the writing current. A moving disk is thus magnetized in the positive (North) direction for positive current and is magnetized in the negative (South) direction for negative current flow. In other words, the stored ones show up where reversals in magnetic direction occur on the disk and the zeroes reside between the ones. Computers get better and better, faster and faster; and, of all computer components, probably the greatest rate of evolution belongs to the stalwart hard drive. On a daily basis, the storage capacity and speed of hard drives increases, while their cost just keeps on shrinking. This is one of those rare situations in which both consumers and companies profit; but something called superparamagnetic effect may soon bring an end to this golden age. As hard drives become capable of storing more information and accessing it at faster speeds, their data becomes more susceptible to corruption. This data-density barrier is known as the superparamagnetic effect (or SPE). Before going on to say more about SPE, though, it might be helpful (and scenic) to take a brief detour to examine the technology at the hub of your average hard drive. Today's hard drive resembles a small record player that's capable of stacking its disks, or platters, to hold up to eight of them at a time. Each platter is covered with a magnetic film that is ingrained with tiny particles called bits. 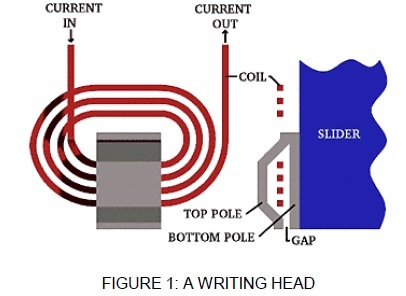 When a read-write head (looking like the needle of a record player) passes over the bits, it either magnetically aligns the particles to record information (turning them into series of 1's and 0's), or it reads them in order to access previously-stored data. These operations take place at phenomenal speeds; the platters spin around thousands of times per minute, and both sides of them are scanned simultaneously by read-write heads. Advances in hard drive technology continue to increase the number of bits that fit onto each platter. Bits are getting smaller and smaller, making for greater storage capacity, but also bring the SPE barrier closer and closer. So what exactly does SPE do? Basically, SPE destabilizes the 0 or 1- orientation of magnetic bits, resulting in corruption of stored data. The superparamagnetic effect originates from the shrinking volume of magnetic grains that compose the hard-disk media, in which data bits are stored as alternating magnetic orientations. To increase data-storage densities while maintaining acceptable performance, designers have shrunk the media's grain diameters and decreased the thickness of the media. For media limited noise signal/noise ratio is proportional to square root of N, where N is the number of media grains per bit.